JOHANNESBURG, Jul 18 2007 (IPS) - Representatives of Sudan&#39s government and rebel groups will meet in the northern Tanzanian town of Arusha next month in a bid to hammer out a deal to end four years of conflict in Darfur. The Aug. 3-5 conference was announced Monday at the end of a two-day gathering in Libya&#39s capital, Tripoli, organised by the African Union (AU) and the United Nations – also aimed at finding a solution to the crisis in the western Sudanese region. While the Libyan meeting was attended by Sudan&#39s government, the European Union and representatives of 14 other countries, none of Darfur&#39s rebel groups took part. Korwa Adar, a senior researcher at Africa Institute of South Africa, a think tank based in the capital of Pretoria, says a repeat of this situation must be avoided for the Arusha talks to have any chance of success. "The Arusha conference…must be inclusive. Rebel groups, civil society organisations, politicians – representatives of all stakeholders – must be included, because you don&#39t want to give an opportunity for others to sabotage the peace process now or in the future," he told IPS. "It&#39s good to involve all the players in the negotiations for (talks) to have an enduring effect," added Adar, also the co-editor of &#39Sudan Peace Process: Challenges and Future Prospects&#39. While the guerrilla campaign against Sudan&#39s government in Darfur was initially launched by two rebel movements in 2003, there are now about a dozen groupings. This has complicated peace efforts, says Timothy Otieno, a researcher at the Johannesburg-based Institute for Global Dialogue, also a think tank. "Khartoum would like to play one rebel group off against the other," he told IPS. "This will not bring peace." A new rebel coalition called the United Front for Liberation and Development was announced over the weekend in the Eritrean capital, Asmara. The group has been formed with a view to presenting a united front in peace talks with Khartoum; however, it only includes the Sudan Federal Democratic Alliance, the Revolutionary Democratic Front Forces and two smaller factions of the Sudan Liberation Army. Major rebel groups like the Justice and Equality Movement and the Greater Sudan Liberation Movement remain outside the coalition. This is not the first attempt to unite Darfur&#39s rebels. Twice this year, the semi-autonomous Government of Southern Sudan (GOSS) has tried – and failed – to bring the rebels to Juba, the capital of south Sudan. GOSS President Salva Kiir, who is also the first vice-president of Sudan, traveled to Chad and Libya in a bid to persuade the rebels to meet in Juba. In addition, Kiir&#39s party, the Sudan People&#39s Liberation Movement, has named a special envoy for Darfur, Clement Janda; he is currently meeting with various rebel groups to help them unify their position. Kiir wants to avoid repeating events of 2006, when a peace deal was reached in the Nigerian capital of Abuja, but signed by only one rebel faction. Noted Otieno: "The 2006 Abuja deal was accepted by one rebel group out of three. This is why it doesn&#39t hold water. You cannot exclude the major players, whatever disagreement you have with them. They determine what goes on the ground. They can cause havoc." As efforts to convene the next round of peace talks proceed, the United Nations is putting together a hybrid force of more than 20,000 peacekeepers to monitor and protect civilians in Darfur. The world body says over 200,000 people have been killed and more than two million displaced there since fighting erupted over alleged marginalisation of the area. 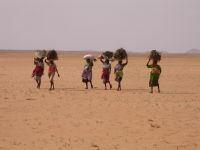 Sudan&#39s government responded to the rebel offensive with aerial bombardments, and by supporting attacks by Arab militants known as "janjaweed" – or "men on horseback" – accused of carrying out atrocities in Darfur. Nomadic Arabs have for many years been at odds with settled ethnic groups in the region over control of resources. The AU has already deployed 7,000 peacekeepers in Darfur, which is approximately the size of France. However, these troops are ill-equipped. "The U.N. should give financial and diplomatic support to the AU like the AU gave IGAD to resolve the north-south conflict," Adar said, in reference to the mediation of the Inter-Governmental Authority on Development in the 21-year conflict between north and south Sudan – which ended with a 2005 accord. IGAD comprises Djibouti, Eritrea, Ethiopia, Kenya, Somalia, Sudan and Uganda. Sudanese President Omar al Bashir has previously made it clear that he prefers peacekeepers under the command of the AU, even threatening to fight U.N. forces if they deployed in Darfur without Khartoum&#39s consent. But the head of state appears to have shifted his stance now. "Sudan has been forced by the international community to accept the hybrid (U.N. and AU) force," Adar said.